You will probably need to replace subflooring in a mobile home eventually, especially if it’s an older home or you have encountered a leak. The subflooring is not your carpet or vinyl, we’re talking about the wood under that. In this article, you will learn the step-by-step process of replacing the subfloor in a mobile home. We have videos and images that will give you the visual information you need and, of course, in-depth descriptions and instructions on how to replace your subfloor. What is the Subfloor in a Mobile Home? For many years, mobile homes have been constructed with sub-flooring made of particle board which is made from sawdust and glue that essentially acts like a sponge when it gets wet. Even the least amount of dampness causes bowing, warping, rot, and soft spots. Even in newer homes, where particle board wasn’t used, flooring can become warped or softened due to a small leak or routine encounters with water. 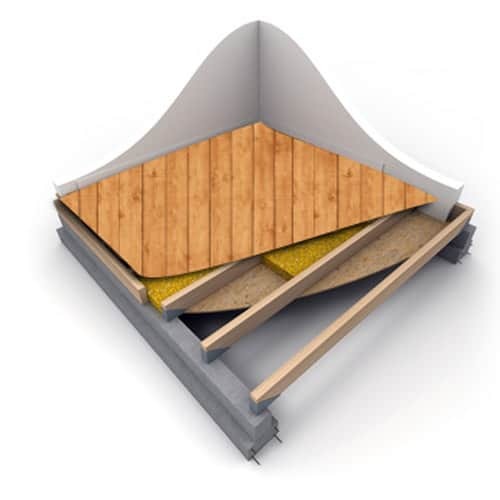 Most newer homes now use a higher grade plywood or OSB because it can withstand water better. Still, if you have a soft spot or bowing in any area it’s best to replace the subflooring in a mobile home quickly before it causes further damage. Hopefully, this article will give you enough information to replace flooring in a mobile home yourself. Of course, if you have any questions feel free to add them in the comments and I’ll do my best to help. 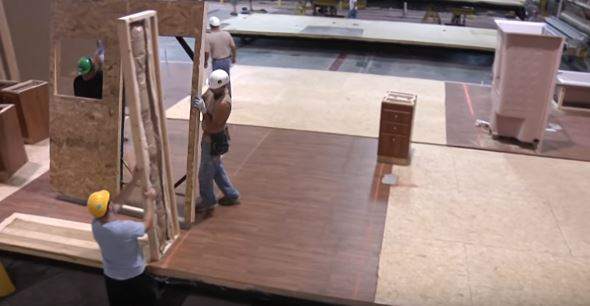 Is Replacing Flooring in a Mobile Home a DIY Project? To replace flooring in a mobile home you will need experience in construction. This is not a job for someone that has never used a hammer. On a scale of 1 to 10, I would rank it a 7 because no specialty tools are required and the material list is short but it is a tedious job and it must be done right. 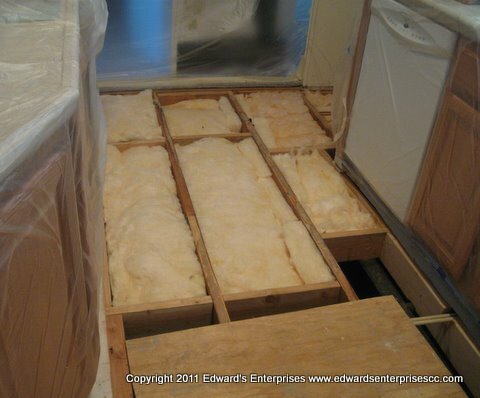 Replacing the subflooring in a mobile home bathroom can be a complex project. Since you are dealing with major components of your home like plumbing, wiring, and walls a professional should be present. The image above shows the complex plumbing you may encounter in a mobile home bathroom. The most difficult parts of the job are removing the old flooring, building out the perimeter joists, and keeping everything level. We’ll deal with all of those issues in the step by step process below. 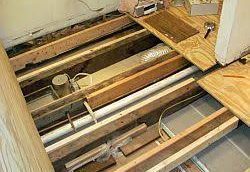 if you can’t replace the subfloor yourself this article will at least show you what to expect when you hire someone else to do it. Cutting out the floor to replace it. For bathroom or kitchens consider marine-grade plywood. It’s more expensive but it has waterproofing so it stands against water better. This is a ‘quick and dirty’ list of the basic steps needed to replace flooring in a mobile home. The first step to replacing rotted flooring in a mobile home is to remove the trim and floor covering. If it’s carpet you will need to remove the strips. Vinyl will usually need to be cut around the perimeter of the room and tile will need to be ripped up. If a leak caused rotting or flooring warping and bowing you must find it and repair it before moving on to the next step. With the floor covering removed you will be able to trace the leak better. Follow the damage. Most of the time it will be a window or roofing issue and the water is running down the wall. Bad toilet rings and damages water supply lines are another common source of leaks in mobile homes. You can learn more about mobile home plumbing repair here. You may need to use a Dremel tool or knife to get the subflooring out from underneath the walls if the sub-flooring is damaged or rotted. If it’s healthy, you’ll likely want to leave the subflooring under the walls alone. 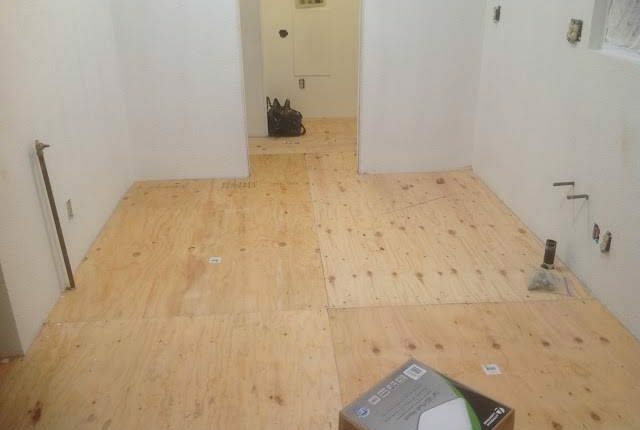 The subfloor and floor covering are installed before the walls when a manufactured home is built. Manufactured home builders construct homes in layers. All the flooring is laid before the walls are installed so chances are your flooring and floor covering will be under the entire wall. Next, you will need to measure your subfloor. Most subfloors are either 3/4″ or 5/8″ thick. You will use the measurement to set your circular saw to the proper height. 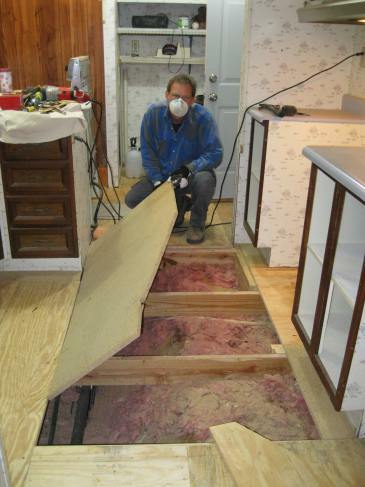 One of the most tedious parts of replacing subflooring in mobile homes is the removal of the original sub-flooring. If your flooring is 3/4″ set your circular saw to that and follow the perimeter along the edge of the room. You do not want to touch the joists below. This is one of those tedious jobs no one likes to do! Now that you’ve cut the sub-flooring around the edges, you will need to cut them down so you can remove them easier. The smaller the pieces, the easier it is to get them out of your way. If you have ensured there are no pipes or wires between the joists you can simply saw between the joists and remove each piece. Remember to keep the saw set to the same thickness of the flooring to keep so you do not damage the joists. If you can cut out an inch or so under the wall without damaging the wall you can slide the new sub-floor under the wall. This is the ideal method in the subflooring is rotted or weakened in any way. In the image below, the homeowners just cut the perimeter and left the original subflooring under the wall. This is fine since the flooring was not damaged under the wall. At this point, all the sub-flooring has been removed and you have a perfect opportunity to inspect the joists for any damage. If you do see damage, you can reinforce it by adding an additional 2 x 6 to the original or removing and replacing. If there’s not much damage, reinforcing is probably easier. Measure the space between the joists so you can cut the lumber (2×6) to the right length so they fit in between the joists. This should be a top priority. Spending an extra $30 can save you a lot more in energy costs in the future. Remember, wiring and piping should be above the insulation so that the heat from the home can get to it. See the short joists? Those are placed where the new subfloor panels meet. Around the perimeter of the room, you will need to attach an additional 2 x 4 to the original so that you have a shelf or lip to lay the new sub-floor down, then nail and glue. At each seam, where one piece of plywood ends and another begins, you will need to reinforce under it. This means you will need to add a 2 x 4 between the original joists so you have a place to nail and glue down the plywood. You can see this happening in the photo above, where the small boards have been added between the long joists. Sub-flooring should be laid in the same direction as the original, usually opposite the direction of the joists. New subflooring in a mobile home. Luckily, your choices are endless when it comes to floor covering for mobile homes. If it’s in a bathroom, it’s probably best you go with a thick vinyl that has some protection against water will help protect your floor. New floor covering installed in a single wide. Congratulations, you have a great looking floor that will last for many years! 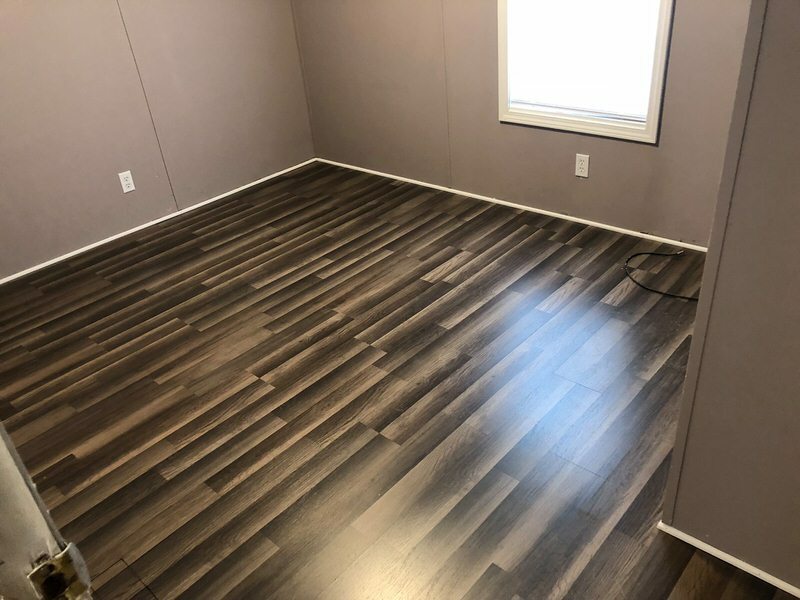 New flooring in a mobile home. It is complex to replace subflooring in a mobile home but it’s a common project for homeowners of older mobile homes. New subflooring, along with new insulation, will help your home last longer and save heating and cooling costs. Thank you so much! Mobile Home Repair has a forum that covers all kinds of topics. We are having vinyl planking installed, and trying to have some squeaking floors also addressed. Even though installer put in some extra screws, the squeking seems even more noticeable. What would you recommend to alliviate squeaks? You’ll probably need to go under the home to get the squeak out. Screwing the subfloor down tighter against the joists usually helps but if the subfloor is bowed or doesn’t have enough support in an area it may need to be shimmed between the floor and the joist. Here’s an article that explains the process better. I have had some water issues and the last crew I hired didn’t remove the damaged flooring first. They actually made it worse by causing a mold issue. Since then I’ve gotten another serious water issue with damage. I’m on disability and can’t afford to keep hiring someone to redo the same job. I’m in Kentucky. Is it possible there may be some agencies available who do this type of repair for disabled seniors at a discount? There are some programs but they are hard to get into. This article can give you some good ideas for help. Best of luck! It’s impossible for me to tell without taking a look at it. You’ll want to find 3 different companies to get appraisals to get a good idea. Best of luck! I have a 2010 double wide, my hot water heater leaked. The pan that was under it had a crack so the water seeped through. Now where the hot water tank sat and to the front of the closet it sat in next to my dryer is all wet. My husband has ideas how to fix it but doesn’t know if we have to replace the whole floor and how far the joiset are. Would they be 16 on center or are they farther apart. After we get this fixed I’m putting ceramic tile down..
16″ OC or 24″ OC are the two most popular measurements. I’d love to share your project with our readers, it could help a lot of people. Please consider taking some photos of the process for me! Thanks! If I have a MH on a permanent foundation with new subfloors, what is your opinion on a decorative floor coating system that is covered in epoxy? I’m looking to replicate the terrazzo style, but was concerned if it would still crack if the home was on a permanent foundation? Also, is putting large 30″ stone or terrazzo tiles doable in a double wide, or are vinyl tiles my only option? Thank you. Hi Ben, I emailed you. I’m not really familiar with epoxy flooring systems but I do not recommend crossing the marriage line with any kind of tile though because of shifting possibilities. Sorry, I can’t help much. You suggested in one of your responses that laminate wood floor could even be placed over carpet, saving the expense of removing the carpet. Is this really possible. We installed our laminated floating floor from Lowe’s over the carpet and have had no issues at all. It’s been up for 5.5 years. Our carpet wasn’t indoor/outdoor carpet but it wasn’t the thick stuff, either. I’d call it ‘flat.’ It’s absolutely possible but every home is different due to leveling and carpet thickness so it’s hard to give a definite yes. Thank you, Barry! It’s definitely been a learn as I go experience. I appreciate you taking the time to comment kind words, it really means a lot. Thank you! Please help,I Live in Norwich, Ct and I am in need of a repair man who can fix a small portion of subflooring. Any help would be greatly appreciated. Thank you. You will likely have the best luck finding someone by calling your local mobile home supply store. They will at least know which local companies will work on manufactured housing and that’s a good start. 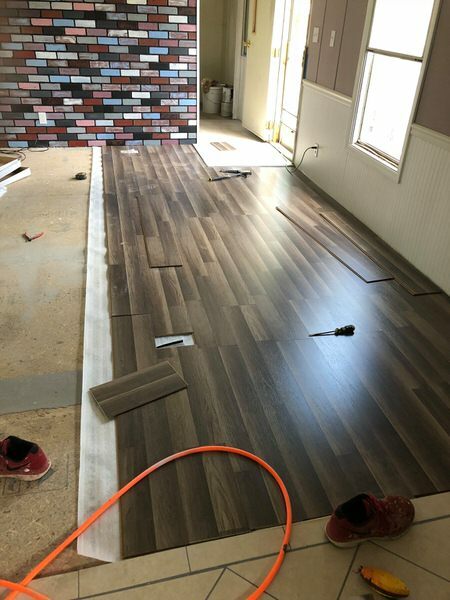 Subflooring is a standard construction issue in both mobile homes and traditional site-built homes so perhaps going on HomeAdviser.com and looking for flooring help. I’m looking into purchasing a 1984 Schult built double wide. Your video and written articles have really helped me what to look for. and I’ll be educated when looking for a repair man for help. Thank you for this great information you have given. I have a double wide mobile home in Huntington Beach, Ca. I had a friend install a new Garbage Disposal a few months ago. Well, he had an accident, he actually broke one of my small plastic pipes under the kitchen sink. Well water came pouring out. And now my kitchen floor and under the kitchen sink is sinking…. Please, help me…. I need to find a person who is reasonable in price, since I am a single mother. To put in new flooring in my kitchen. Can you tell me where I can get some estimates in Huntington Beach, Ca.? Yikes! I’m so sorry that happened. I don’t know a soul in California, unfortunately. I would call your local mobile home supply store and ask them for references. Craigslist or Angie’s List may be a good place as well. Also, this may be a great time to install new cabinets if you haven’t already and here’s why: You can save money by demolishing all the old cabinets yourself especially if you have the standard cabinetry found in most manufactured homes they are ‘built-in.’ You can save a ton of labor and refuse costs by doing this. Then, the new floor will be laid and you can install pre-built cabinets from Lowe’s quicker than you could re-install the old cabinets back. Of course, every situation is different but make sure you calculate the project both ways to see which would be more affordable. The guy who caused the leak is responsible for the resulting costs. My husband was putting in some wood strips between the vinyl floor and the carpeting and the screws were bending rather than going in. Is there a special way or certain screw type needed? He was using screws for wood and we know the floor underneath is particle board with many staples in it. Perhaps the screws are not strong enough? Help! You may have an old metal strip there or it could be the joists. Try drilling pilot hole a bit smaller than the threads on your screw and see if that works. Is there a way to replace the belly wrap that is on my home? 1990 double wide? I’ve replaced floors, but putting batts of insulation down on the saggy plastic doesn’t seem a good idea. There is only around 18″ between belly and ground at one end. Yes, Ma’am. You will want to go to the local mobile home supply store and buy a new one. You will install the new belly wrap after you finished with the insulation (while you’re under there make sure your duct work is tight). Stretching and stapling/nailing the wrap is a real pain but it’s easier with help. Just do the best you can to get that short end sealed. The belly wrap is important for heat retention. Hi. I live in an old (1996) mobile home. The toilet was leaking for some time and I didn’t notice until I saw that the floor looked kind of warped. Being a mother of 4 children, I don’t have extra money to hire someone to fix the floor. I really need to get it fixed because it feels like the toilet is going to fall through the floor at any time. Could you please give me a detailed description of what to do to get the wood replaced. I know that I’ll need to get a saw at home depot because I only have the basics as far as tools go. But I just can’t figure out where to start cutting the floor without ruining it or making things worse. I’ve got absolutely no experience in repairing things like this, but I’m very determined! Any advice would be greatly appreciated. Thanks. Just follow the directions in the article above. There’s a tool list as well. You’ll need to remove the floor covering, then the subflooring (without damaging or cutting anything else). Then, you will lay new subflooring down and replace the floor covering. have been tenderness in helping us with our goal. Your web site has been the most helpful site I’ve ever found. Thank you for creating a well researched & informative article for the DIY population. Thank you so much for taking the time to write this comment, Robert! You can buy the replacement ceiling panels at your local mobile home supply store. You’ll simply rip out the old and lay in the new over the wall lip. This is a perfect time to replace the trim around the top of the room to something a bit more substantial that will help you with an easier ceiling install and make the room look a little more grounded. You can also buy a ceiling kit at Lowe’s that is in different patterns such as shiplap. We’ve used beadboard paneling in a few mobile homes too. There are a lot of options but I’ll be honest, ceilings are not easy. Just looking up all day is a pain and then dealing with the seams (building out a frame is sometimes needed) is another big pain. It’s a job but it makes the whole home look completely different. Best of luck! If you can take pictures while youre doing the project I would love to write out a how-to article and use your pics. Let me know how it goes! I’m still really impressed with the cheapest laminated floating floor that we bought at Lowe’s. It has withstood 4 dogs, 3 humans, countless furniture moves and wet winters over the last 5 years. We did the entire home (697 sq. ft.) for around $450 (.79 sq foot I believe). If you can splurge and get the .99 or $1.39 per square foot that will be an even higher quality. Hope that helps! I have a question about installing chair rail moulding around my mobile home. How would I do this over the slats that connect the panels ? You will need to cut the strips or slats. You won’t want any kind of bulge so if its just the chair rail and not wainscoting you’ll just cut out the section where the rail will be installed. If you are adding wainscoting you will cut and remove the entire bottom section. Make sure to keep them just in case you decide to remove the chair rail in the future. Best of luck! We did a complete redo of the master bath. Took us almost 2 years to get thin, pre-papered wall panels and floor ripped out. EVERY piece was glued and stapled to EVERY stud and joice. We had to chisel and sand each and every one. I have not seen this on any video. We now need to do kitchen, floor has 2 soft spots in it. This is a large 2000 manufactured on a 4′ poured concrete foundation. ACK!! help! Some builders do things a bit differently though I can’t imagine why they felt the need to glue and staple so much. While I want to say this is a good thing because it would certainly hold up over time, it would be a pain when it comes to remodeling. You may want to check into a product that dissolves glue. I was always afraid to use paint dissolvers but after I used them the first time I was mad at myself for not trying them sooner. They didn’t hurt the wood at all. My floor in front of my door wall is damaged from water and pets. The previous owners built a porch right up to the mobile home and every time it rains or ice melts the water goes under the wall . We are trying to fix the damage before we have a new floor put in. I see where electrical lines are. Should I put plastic under our door wall to keep our floor dry? Where are the best places to find a new door wall for our 1985 mobile home? If you are replacing the wall and the floor anyway you may want to install a regular size door (available at Lowe’s or Home Depot) – it may be cheaper than buying the special manufactured home size doors. You’ll need to Google search your location and the words “mobile home supply” or try one of the online suppliers (look on the right side of this article for a link to our affiliates). You should provide a layer of plastic sheeting on the wall (over the insulation and under the siding). Hi there! I also was going to have laminate hardwood installed today in my mobile home living room and was told the subfloor is too weak. Does this mean we take out the subfloor from the living room and replace it with plywood? It sounds very scary and I’m so worried it’s not that simple. Hmmm…can you send me a photo of your subflooring and maybe get a measurement of the thickness. Does your flooring bounce or have any bows or bubbles? I have never seen a subflooring that couldn’t handle floating flooring – unless it’s been damaged by water or fire. We just purchased a 1973 doublewide MH and it needs so much work. I love the layout and really want to try and save it. There was many leaks in previous years and several soft spots on the floors. There is also a composite type ceiling which I’d love to replace with drywall, as well as all the paneling throughout the entire home. I’d also like to add an addition, as well as put it on a permanent foundation, then eventually replace the roof with a metal roof. I’d also like to move a few walls and reorganize the 1/2 bath, laundry and redo the entire full bath. I would truly love your honest opinion if this would be worth it, or if I should just replace the MH/build a house. Where should I begin? I’m a novice what-to-be carpenter/builder. Thank you so much for your website and helping me have hope. Without looking at it I can’t really give you much of a suggestion. Based on what you’ve described, I can assure you that you are looking at a LOT of work and a lot of expensive materials. It very well may be more affordable and less hassle for you to spend your money on a house that has been at least partially updated. If you are doing the work yourself you can save a lot of money but if you will have to hire it out it could get very expensive, very quickly. In my experience, when you start working on a home you will always find more things wrong with it than you planned (especially after removing the flooring or paneling after a leak). You’ll need to ensure that all the leaks are repaired (so, maybe a new roof needs to be first on the list) before you repair or replace anything and with soft spots on the sub-flooring you will likely need to replace some of the studs too. 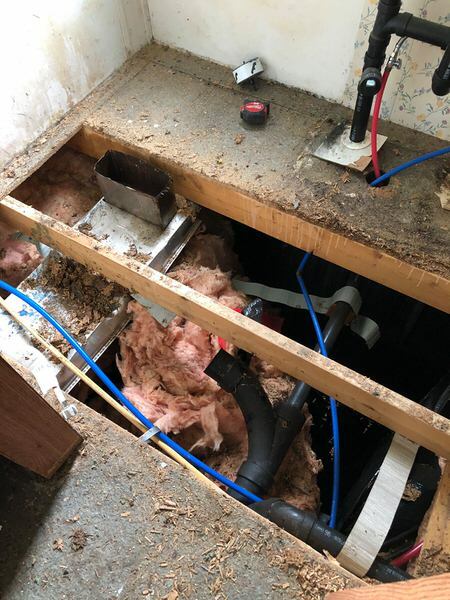 Black mold could be a problem and the electrical system may need to be updated to a modern breaker box and modern wires and the plumbing will likely need to be upgraded if the original pipes used were recalled (some of the grey water pipes). I guess my answer would really depend on just how much work is needed. You want to be sure you don’t spend more than the home could ever be worth and you are being very smart by asking the tough questions. Our 1978 single wide already had new electrical, new flooring, new roof, and new plumbing and we are still working on it 5 years after buying it (still needs the bathroom and the kitchen updated). Planning a remodel and actually doing it are two completely different things and it was a hard lesson for me to learn but I definitely learned it! Is a handyman sufficient to make the bladder repairs or should this work be completed by a contractor? Where would we get the bladder material to make the repairs. It sounds like the shower pan needs replaced and that’s typically a plumber’s area of expertise. Unfortunately, the entire shower has to be removed to get to the shower pan – it’s a waterproof membrane that acts a barrier between the sub-floor and the shower itself. If the inspector is seeing water damage in the subflooring than there is likely a leak and if it’s been neglected for a while the old wood (sub-flooring and possibly even the framing) will need to be replaced. I doubt there would be any way to go under the home and repair it correctly. This would be a good time to replace the shower alltogether! Best of luck to you and your mother! Thanks so much for the detailed response. I’m thinking we’ll want to lay down a moisture barrier between the flooring and the subfloor, as well as put in real plywood. Yes ma’am. In the kitchen, mud room, and bathrooms moisture barriers are a must have! Practically every older manufactured home (15+ years old) I’ve ever dealt with has some kind of water damage in the floor. Usually it’s the bathrooms. The smallest leak can bloat, bow, and ultimately destroy the particle board sub-flooring that is often used in manufactured homes. Since you’ve already replaced it you shouldn’t have to worry about it for a very long time. I really like the new vinyl on the market. It’s thick so it has a nice cushion to it that is perfect for standing while cooking. It’s practically indestructible by water too. The only downside is you most likely have to have it professionally installed. It’s not impossible to do it yourself but if you have some odd cuts you may have a tough time. I’d love to see photos when you get it all finished! I bet it’s gorgeous! Thanks so much for reading MHL! When installing new plumbing in an old (1979) mobile home, can it be done from underneath the trailer, or does it need to be done by removing the flooring? If it can be done either way, which is easier? You can add it under the home and just run it through the floor at each faucet/water source. It should be directly under the home but above your plastic sheeting (or belly wrap) to help keep it from freezing. If you run it close to your vents you can also keep it from freezing. I am buying a 1983 mobile home. I am 63 and want to fix it so I can live in it for the rest of my life. There are holes in the floors in different room, so I know the roof would need fix. I have been reading and there is a rubber stuff you roll on and it is suppose to stop ALL leaks, is this the best way to go? 2) the sliding looks bad and missing on back side about 4 panels, from roof to bottom., I want to try to replace it, depends on price, I am wondering, can I remove the sliding on the outside and pull all installation out and put in new (make sure no Bugs, ect: in the walls. and then put up new sliding. Is this the best way to go? I do see a lot of rotting in several areas outside at top of sliding. You sure can remove the siding and install more insulation. You may want to consider installing a waterproof membrane over the insulation before adding the siding (some homes have it, some don’t but it’s always a good idea). You can also box it in too. You should be able to find a suitable siding at a good price, sheet metal comes in all kinds of different colors these days. You can re-roof your home at a fairly affordable price. I assume you have a flat roof so you have a few different options (rubber, metal). I added some links and additional information on your other comment so hopefully you get both of my replies. If you have any other questions please don’t hesitate to contact me via comments or email me directly at crystaladkins!mobilehomeliving.org. I have lived in a double-wide since 1987, and it now needs some major work. However, a few years ago I had water-damaged areas replaced in bathroom and under two windows in living room and bedroom. During the process, the fiberboard sub-flooring revealed a serious warning that makes me hesitate about any further work. In bold letters, each sheet of fiberboard warned “Resin formaldehyde Causes respiratory distress.” By the time it was revealed, it was too late to do more than tell workman to wear a respirator, and I tried to avoid the area and ventilate the house as much as possible (ventilation is awful in this house). I bought this place from an elderly couple when it was only about a year old, but they were not honest about anything pertaining to the structure, and violated the contract by removing window treatments and substituting appliances with Goodwill purchases. I did not try to fight them, because they had already threatened legal action when I changed my mind and told them to keep my downpayment. Three lawyers refused to help me — saying real estate was an investment that I could resell. New carpeting, vinyl and paint were added while I tried to sell it, but I finally had to move into it due to finances. It had been shut up during a long, hot summer, and I immediately became so sick that I could not walk due to the vertigo and nausea (crawled to bathroom). Now I know that I was reacting to the off-gassing of the new floor coverings, paint, formaldehyde, paneling and the entire building that was still fairly new. I was sick again after the water damage was repaired and a new carpet installed in the living room. My little dog and I suffered together, and before the year was out, he died of lung cancer. As far as legal protection, I honestly don’t know. I do know that HUD is the government entity that oversees all manufactured housing. They have 38 state administrative agency offices (I think that’s the number) and then the national offices in DC. Here’s contact information on their website, perhaps if you can call your state office (if there is one in your state) you may be able to get some kind of help, especially if the fumes released surpass a certain number of measurement. Good luck! I know you feel cheated and alone and the sad thing about it all is that you probably have little power to get anything done. It’s not fair but it’s the truth. There is probably some kind of clause somewhere that stipulates all formaldehyde complaints have to be made within a certain amount of time (or something similar). It is stuff like this that is so frustrating when it comes to home buying (and it happens in site-built homes too). I wish you the best!